Kipsta is a brand owned by French sports shop Decathlon, and their first try at top flight rugby shirts was pretty interesting and not unsuccessful. 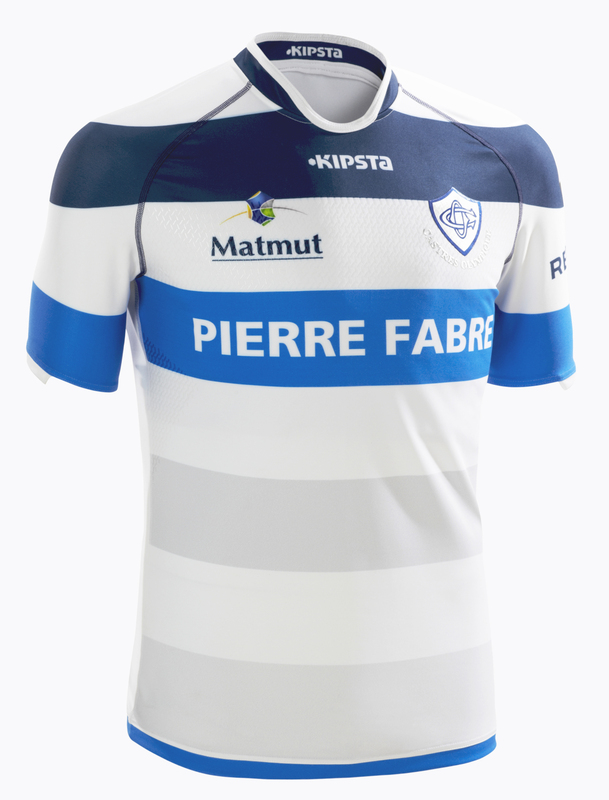 God knows they had enough goes at making a new shirt, as Castres not only had regular home and away shirts last season, but home and away Euro shirts, too! This year, there’s only three shirts, and the Euro shirt is gonna be designed by a fan, but clearly having fewer designs to work with has had the effect of focussing Kipsta’s designers onto making something utterly gorgeous because, well… just look at the damn thing! Our love affair with hooped jerseys has been repeated so many times on this site that it’s probably getting a bit weird now, but even by our low bar for hoop-love, we adore this design even more than normal. The home repeats the trick of last season’s shirt by using a variety of different shades of blue on the various hoops, paired with a really gorgeous, eye-catching white stripe across the chest that gives a pretty classic-looking shirt a definite modern twist. The alternate shirt might actually be even nicer than the home – the use of light grey and white for the basic hoops with splashes of light and dark blue across the chest works so well here, especially as those hoops continue into the sleeves in gorgeously old-school style. Combined with Kipsta’s classy, understated Canterbury Loop-esque collar, these are two of the most beautiful shirts we’ve seen so far this season. Whisper it, but they might be giving the soon-to-be replaced Cardiff Blues 2013/15 home shirt from Canterbury a run for its money as our favourite hooped shirt design of recent years. 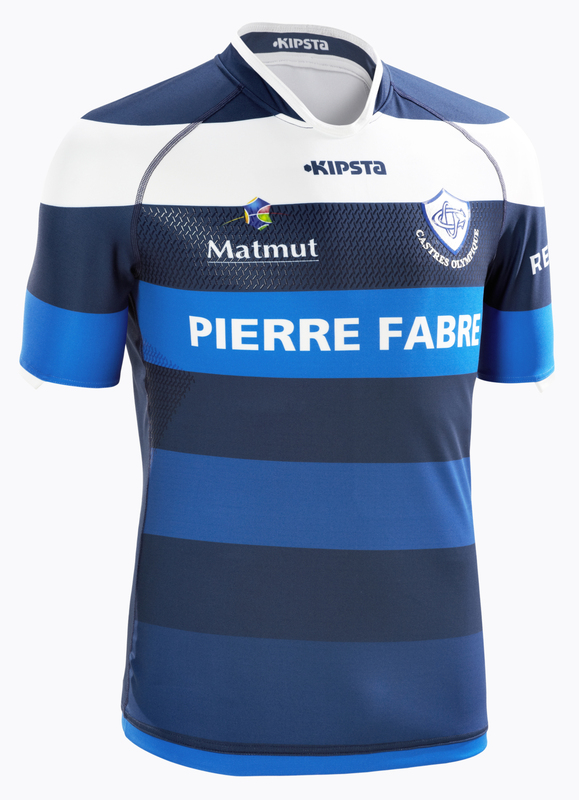 Castres had a season to forget last year, and fans of the club probably won’t remember their first Kipsta design with much fondness as a result. We don’t know if this year will be different, but they’ll be wearing some jerseys that definitely deserve to go down in history as modern classics. Another disappointment: why on earth did they keep the club’s name in white on the alternate shirt? White on white… Really guys ?! We like that! It’s embossed and slightly reflective, so will catch the eye under lights. I’m with RSW. I love them.